We had 93 in the House for the final session. I have to say at the outset, that our scorekeepers try hard to get it right but for pretty much every session, it means 1,750 answers have to be evaluated and added up before it is entered into the computer I bring – and even here, those scores for the Round (175 in all) have to be entered accurately. Sometimes one or more entries are either mis-added or mis-entered- but it is not very many and some mistakes get made. In the review of the scorecards I carry out in the making of these reports (NOT exhaustive), I sometimes find an error and correct it. It was unfortunate that Cashew lost two points by an error and in fact, won the night by a point. As it was too late when this was noticed for implementation; the Cashew team graciously declined to fuss; even though their budget could have been bolstered. That error did not change their overall third place. The champions were, as last year, the fine team of We Know Stuff. Cheap Dates came in second for the year. 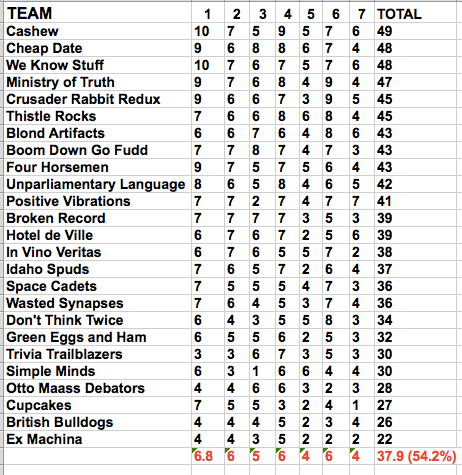 The Blond Artifacts and The Ministry trailed just a few points behind for a close finish. 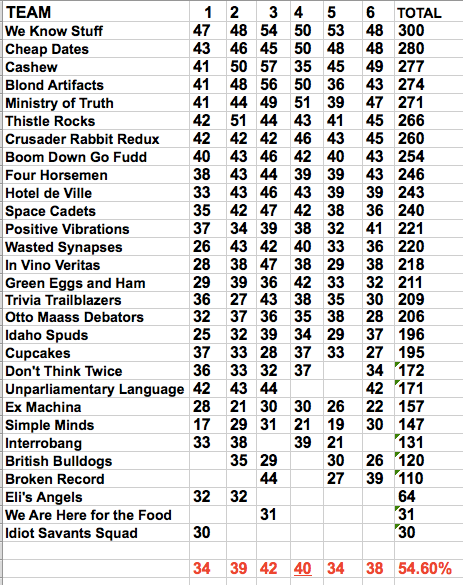 The evening got off to a “good” start in Round 1 with 2 10s (Cashew, We Know Stuff) and 4 teams with 9s (Cheap Dates, The Ministry, The Crusaders, and The Four Horsemen. However, Round 2 brought it back to normal going from a possible record 68% to a the 57% “norm”. Question 1 was a math query and while 17 teams got it right, 8 miscalculated. I thought a “homework” problem would have warmed up the crowd. Half the House knew Nolan Ryan is the oldest pitcher to throw a no-hitter. Not bad. More than half knew “stagflation” as the economics term that was asked about. All but two teams knew about Nathan’s hot dogs. Nineteen teams got the Twins question; I thought the Elvis Presley inclusion would create a difficulty but then, many know a lot about Elvis. Finally, for Round 1, 19 teams knew about Herman’s Hermits. Great! In Round 2, all but 4 teams knew Toledo as the name of the city in Ohio that was the first to have a sister city (in Spain). Half the teams knew the intricate geography of the two states that border on 8 other states. Only three teams got the 1917 year of that first jazz record and these were the Spuds, Simple Minds and Ex Machina. Quite a few had a good stab at 1923. Round 3 delivered a 52% score. My distractors for the “Jass” answer were pretty good as only 6 teams selected “Jass” as the original name for “Jazz”. All but three teams got that J and Q are not part of the normal periodic table listing. Eight teams knew the history of Damascus, Syria. Hotel de Ville and the Otto Maass team got the cashew fruit question leaving the fine Cashew team with their answer as “current”. Other “C” answers were coconut, cactus, cocoa, cranberry, cloudberry (? ), cassis (? ), cherry, cantaloupe, cactus pear, choke cherry and coffee. Round 4 showed a 64% score although only three got the correct person who took over for Lou Gehrig and these were the Hotel team, the youthful Unparliamentary Language and the Ministry with Babe Dahlgren as the correct answer. Gehrig replaced Wally Pipp. All but 8 got the question as to where Copernicus was from and all but one team knew iron was responsible for the red colour in the Antarctica’s Blood Falls. Every team knew Karl Marx as the originator of the letter to Lincoln. About half the House got the 135 point total by the West Virginia high school basketball player. It is an amazing record as it amounts to 4.2 points per minute and it is even more amazing when compared to Wilt Chamberlain’s NBA record of 100 points in 48 minutes (2.1 points per minute). Many teams recognized the late, great Ricky Nelson, presumably from his distinctive voice. Round 5, I think, set a record for frustration with only a 38% score for the House. Broken Record and the Space Cadets got 1954 as the year of the beginning of the shot clock in the NBA. Eight teams got the historic poker question as to the hand that Wild Bill Hickock held before he was shot—aces and eights. No team knew “Julius” is the name of the Pringles “mascot”. Names suggested were Mr. Spud, Mr. Pringle, Mr. Chips, Peter, Pete, Ned, Chippie, Fred, Mr Pop and finally, Professor Pringle. Those are chips off the old block. ONLY Cheap Dates got Little Anthony and Imperials for the music question; there were many wrong answers including Gladys Knight and the Pips, the Supremes, The Crystals, The 5th Dimension, The Everly Brothers, The Shirelles, and several votes for Martha and the Vandellas (they came up in the next Round). Round 6 scored 60% with most all teams knowing the first two questions of Agra as the location of the Taj Mahal and Steinbeck’s “Of Mice and Men”. Most thought that “Danny’s Doughnuts” evolved into “Dunkin Doughnuts” or the dread Krispy Kream product instead of the three correct answers of “Denny’s” (Thistle Rocks, Wasted Synapses and Space Cadets). Seven teams knew Cezanne (the Ministry, Unparliamentary Language, Green Eggs, Don’t Think Twice, Crusader Rabbit, Cheap Dates and the Hotel group). Finally, Martha and the Vandellas were more popular than I would have guessed and most correctly chose them. The final round showed 5 teams within 3 points of one another and an overall rating for the Round of 40%. The Otto Maass team knew Motorola as the inventors of the car radio as did Positive Vibrations and the Hotel group. Six teams knew one of the Danish King’s names; the only one cited was Christian although Gustav was a popular wrong answer. Only one team dropped the ball on the Quark answer and this should not be an embarrassment for this team (The Ministry) as they have been in the top echelon for 8 years and must have had a forgetful moment. The music question was not easy and probably came to guessing- but educated guessing. It was mentioned that the lead role was not the answer and with the popularity of “Jersey Boys” and Frankie Valli ,the list should have then been four in number. With Louie Bellson and Gene Krupa as famous older drummers, it left only two to pick from; the correct one was Gerry Polci and nine teams chose him (The Blonde Artifacts, Green Eggs, Don’t Think Twice, Broken Record, Space Cadets, Thistle Rocks, Cashew, Four HorsePersons, the Spuds and the Ministry. At the final tally, the top 9 teams required four play-offs. The final results are displayed below along with the totals for the year. I note that our former method of dropping the lowest score would have jostled the top four teams this year although last year, it would not have mattered in the final order. IF you feel strongly that we should re-institute the dropping of the lowest score, let me know. The main reason to have dropped it was that it simply adds some complications at the end of the last night and normally, this mathematical tweak does not change the order. I note that of the 29 teams who participated, 21 attended all of the 6 events. If we consider only the 21 teams and those who only missed two events, the attendance for 25 teams was 97% so missing one event is not a major issue. Weigh in if you think we should return to the original mode of dropping the lowest score. As usual, I thank our May scorekeepers, Julia, Katya and Steven and as always, Kim Stephenson for the help with the money ($3,600 this year and ~$23,000 since we started) and for bookstore gifts. I look forward to our 9th season starting next October.